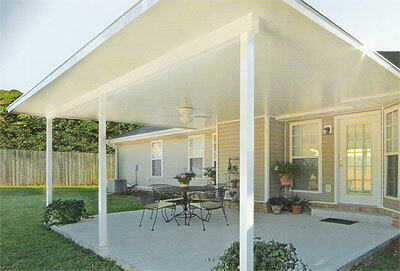 Insulated LRP (Laminated Roof panel) – Our insulated LRP roof panels begin with baked enamel finish on aluminum skins. These aluminum skins are permanently pressure bonded to a 3” core of EPS (Expanded PolyStyrene foam). EPS is high-performance insulation specified by architects nationwide on many of today’s energy efficient homes. Using these insulated panels with our patio components will create a strong durable Cover. 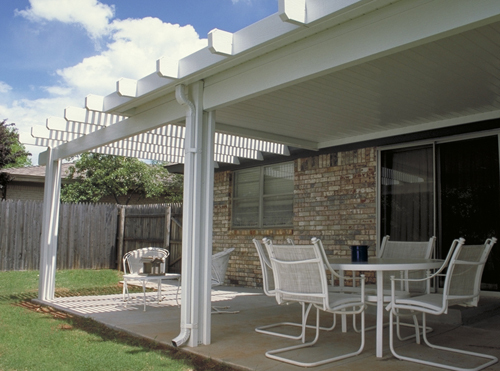 Roll Form Covers – “Flat pan” or “W pan” Covers provide economical, solid shade that protects you and your home from inclement weather and harmful UV rays while also providing shade for relaxing outdoors. 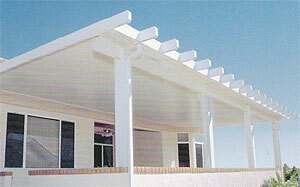 Santa Fe style outer beams in a number of different options can be included on these covers to add character and style. Integrated gutter systems are also included on these covers. Deluxe (lattice wrap) – Combine a solid insulated LRP with embossed aluminum rafters to give enhanced dimension and style to your new Cover. 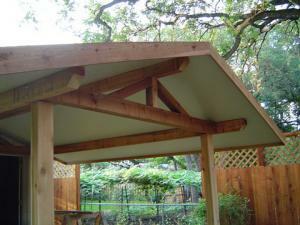 Easily connect a partial shade Pergola with an insulated or Flat pan patio cover for a beautiful shade system that your neighbors will envy and you’ll enjoy for a lifetime. Combination-Want the high performance of our insulated roof system with the beautiful look of cedar? Try our combination cover! Great for those homeowners who love the look of real wood and the high performance of an insulated roof system but need to satisfy HOA (Home Owner’s Association) guidelines.